The identified terrorists of Awami Chhatra League in Nunachara area were involved in various types of immoral activities, including liquor, gambling, etc. for a long time. None from the area dared to open their mouth. Shibir activists formed a local consensus to stop these activities. The terrorists quickly fled when Shibir activists attacked their premises with local people. Later, three Shibir activists were captured and beaten by the Awami Terrorists, who abducted them when they went to drink tea at Nunachhora road the next day. At one stage when it became known, Shibir activists, including locals, came forward to save the three from the clutches of the terrorists. 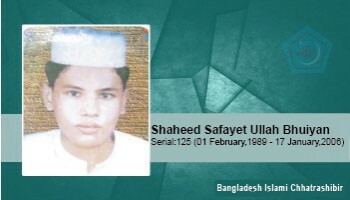 The terrorists who were in hiding, attacked Shibir leader Shafayet Ullah. After being severely injured, he became unconscious on the spot. On the night of January 17, he was taken to Chittagong Medical College Hospital, where he attained martyrdom at 5:00 am. Permanent address: Enayet Ullah Bhuiyan House, Baraiyadala, Sitakunda, Chittagong. Enayet Ullah Bhuiyan House, Baraiyadala, Sitakunda, Chittagong.